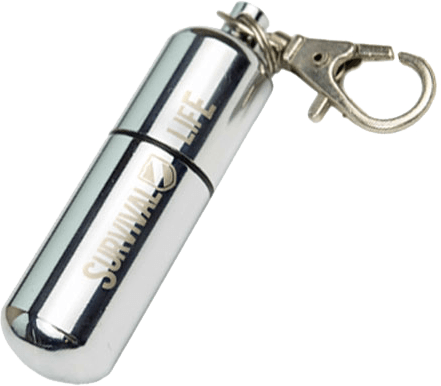 Get this $19 Waterproof Firestarter for FREE! The all new Everstryke Pro has been completely redesigned, with new features like a replaceable flint and wick, and it even lasts 10x longer! Each match is capable of 30,000 long burning strikes. Built in O-Ring keeps fuel from evaporating indefinitely ( A Zippo can run dry in as little as a week!) The Everstryke Pro is even completely waterproof and will start a fire in wind, rain, sleet, or snow. Get yours now for FREE! Just pay $4.95 for shipping. This clever tool is an invaluable, possibly life-saving utensil that is equally at home in your wallet, purse, bug-out bag, toolbox, or even the kitchen drawer. The all new design is made out of solid stainless steel, making it even more rough, tough, rugged, and ready for the trail. Grab one today to make sure that no matter where you are, you’re never more than an arm’s length away from a fire source. PLEASE NOTE: You must be 18 or older to purchase this item. The EverStryke™ Pro Match is a powerful lighter and should be handled with care. The bearer of Everstryke™ Pro Match accepts all responsibility for their use or misuse. We will not be responsible for any injuries or damages.